Wireless DC12V 12A Remote Dimmer Switch Controller LED Dimmer Strip Light RF. Updated Wireless DC12V 12A Remote Dimmer Switch Controller Mini LED Dimmer Strip Light RF. No Screw Driver Needed Just Plug In. Instructions for RF Wireless Remote 1. Turn On/ Standby Press this key to turn on unit or switch to standby mode. Unit will turn on and restore to previous status at powering on moment. Lighting mode Switch to lighting mode from dynamic mode. Dimmer Adjust Shortcuts Switch to 100%, 50%, or 25% brightness lighting mode. 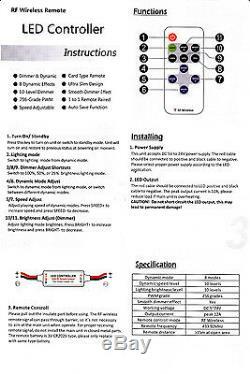 Dynamic Mode Adjust Switch to dynamic mode from lighting mode, or switch between different dynamic modes. Speed Adjust Adjust playing speed of dynamic modes. Press SPEED+ to increase seed and press SPEED- to decrease. Brightness Adjust (Dimmer) Adjust lighting mode brightness. Press BRIGHT+ to increase brightness and press BRIGHT- to decrease. Functions for RF Wireless Remote Dimmer & Dynamic 8 Dynamic Effects 10-level Dimmer 256-Grade PWM Speed Adjustable Card Type Remote Ultra Slim Design Smooth Dimmer Effect 1 to 1 Remote Paired Auto Save Function. Installing for RF Wireless Remote 1. Power Supply This unit accepts DC 5V to 24V power supply. The red cable should be connected to positive and black cable to negative. Please select proper power supply according to the LED application. LED Output The red cable should be connected to LED positive and black cable to negative. The peak output current is 12A, please reduce load if main unit is overheating. CAUTION:Do not short circuit the LED output, this may lead to permanent damage! Remote Control Please pull out the insulate part before using. The RF wireless remote signal can pass through barrier, so its not necessary to aim at the main unit when operate. For proper receiving remote signal, do not install the main unit in closed metal parts. The remote battery is 3V CR2025 type, please only replace with same type battery. Specification Dynamic mode: 8 modes Dynamic speed level: 10 levels Lighting brightness level : 10 levels PWM grade: 256 grades Smooth dimmer effect: Yes Working voltage: DC 524V Output current : peak 12A Remote control mode: RF Wireless Remote frequency: 433.92MHz Remote distance : >15m at open area. 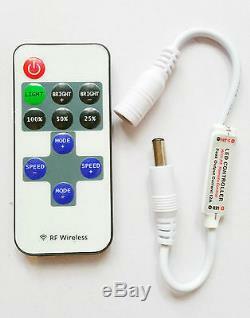 Package includes: 1 x Mini In-line LED Light Controller/Dimmer 1 x RF Wireless Remote Controller R106. If you are outside the UK please select your country from the drop down menu to see the rates to your country. Any items that are faulty after this period then the customer must pay return carriage, We will pay the carriage for the product back to the customer from us. The item "Wireless DC12V 12A Remote Dimmer Switch Controller LED Dimmer Strip Light RF" is in sale since Monday, June 29, 2015. This item is in the category "Home, Furniture & DIY\Lighting\Light Fittings". 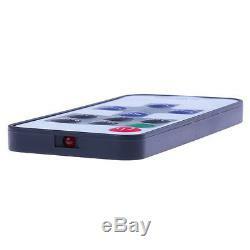 The seller is "tjmshoppingcentre" and is located in Purley. This item can be shipped to North, South, or Latin America, all countries in Europe, Australia, Japan, New Zealand, China, Israel, Hong Kong, Indonesia, Malaysia, Singapore, South Korea, Taiwan, Thailand.